I’ve got a few words to say about cooking with fresh-from-the-garden butternut squash. Got staff? Make them cut it into 1/4 inch dice. Just sayin’. [Heaving a heavy sigh] I learn. Really. No, really. Every year, every garden teaches me new things. Butternut squash can be bought at the farmer’s market, or Kroger’s. I do not have to grow it myself, and, oh by the way, it’s frickin’ hard to cut up. Into 1/4 inch dice. I type with hands and wrists that are in pain. Such a delicate flower. OKAY! Complaining over, let me say that this recipe is to kill for and I send you right now to Fine Cooking’s website to admire it for yourself. I even remembered to take a photo before I ate it this time! By the way, on the side are slices of a luscious tomato — the last of the season — a “Big Rainbow Striped Tomato”, dressed with some extra virgin olive oil, some basil that was a “volunteer” in the garden late this summer and still a lovely plant and sprinkled with some red Alaea sea salt. You can find the heirloom tomato seeds at my drug dealer of choice, Kitchen Garden Seeds. The red sea salt? Das Foods on Amazon. 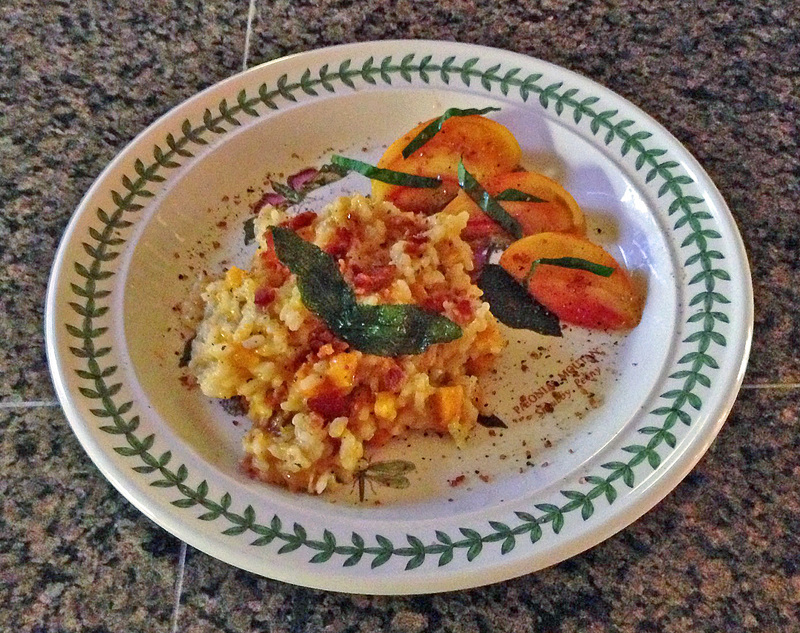 A swell wine pairing for this risotto is Sonoma Cutrer, Russian River Ranches chardonnay. Buon appetito! At my higher end grocery I can sometimes find diced butternut, freshness may be an issue but the bloodletting may be reduced. I’m excited to try this too. I think it will be a first for my family. I do not count old fashioned broccoli-rice casserole as “risotto substitute” LOL YES! I’ve heard the comparison. Leave a reply on "Of Mice and Butternut Squash"